Malaria Killed Half the People Who Have Ever Lived - Fact or Myth? Everything You Need to Know About ObamaCare For 2018 – 2019 How to Lose Body Fat, According to Science What is Tripping? Malaria killed half the people who have ever lived. Did Malaria Really Kill Half of Everyone Who Ever Lived? Malaria would have needed to kill an average of about 5 ½ million people a year to kill half of everyone who ever lived: we don’t have data to prove that it did this. However, we do know that almost half the world’s population is at risk of Malaria, and it kills up to a million a year today despite modern medicine, primarily in Africa. This means the general concept that “Malaria is one of the biggest killers of humans throughout history” is spot on, but specific claims related to this are at best estimates. We explore the logic below. This video discuses the history of Malaria deaths. FACT: Malaria death tolls are nothing like what they used to be, but did you know we still don’t have a malaria vaccine? Although progress has been made in the last ten years toward developing malaria vaccines, there is currently no effective worldwide malaria vaccine on the market. Learn more at the CDC. We know from written works that malaria or a disease resembling malaria has been noted for more than 4,000 years. However, the first evidence of malaria parasites was found in mosquitoes preserved in amber from the Paleocene period that are approximately 30 million years old. We can thus reasonably speculate Malaria has existed throughout human evolution. According to “The World Health Report 1999” (WHO) “during the first half of the 20th century, the world sustained around 2 million deaths from malaria each year”. Those deaths were mostly children in the Middle East, through the Indian subcontinent and South-East Asia, to the islands of the Western Pacific, including those of Indonesia and the Philippines. This rate of 2 million deaths a year occurred despite the disease being preventable and treatable in the west. This video explains Malaria deaths and preventive efforts in the 2000s. Given the actual death rate, averted case, and the current world population, it’s likely that Malaria killed less than half of all people who ever lived, despite the evidence that it could easily have been one of the leading causes of death throughout human history. The factoid is close to true, but, at the end of the day, it is too much of a guesstimate/generalization to be declared a fact. While we don’t know exactly how many died from Malaria throughout history, we can safely say, “Malaria could have potentially killed nearly to half the people who ever lived, predominantly children”. “The History of Malaria, an Ancient Disease“. Cdc.gov. Retrieved Sept 29, 2015. “Malaria Killed Half the People Who Have Ever Lived“. Rdparasites.blogspot.com. Retrieved Sept 29, 2015. This source cite’s Carl Haub, of the Population Reference Bureau for data on world population. “World Health Report 1999“. Who.int. Retrieved Sept 29, 2015. “World Health Report 2014”. Who.int. Retrieved Sept 29, 2015. “History of Malaria“. Wikipedia.org. Retrieved Sept 29. 2915. Also it is noteworthy to include the fact that the modern humans lived in only in Africa (where Malaria is prevalent) for much of history. Homo sapiens emerged in Africa about 200,000 years ago, spread across Eurasia 60,000 years ago, and migrated to Americas 10,000 years ago. Good call. This could certainly skew the numbers upward. In addition to the above, P. falciparum (the most virulent and fatal form of malaria) occurs only in sub saharan africa, while malaria strains found outside Africa such as P. vivax are much milder. Malaria alone was able to exert enough selection pressure upon human population to evolve sickle cell trait, and 25% of Africans carry sickle cell gene. This high prevalence was the result even DESPITE the potentially fatal complications of sickle cell anemia, means that the disease even forced our specie to evolve a fatally disadvantageous trait in order to resist it. 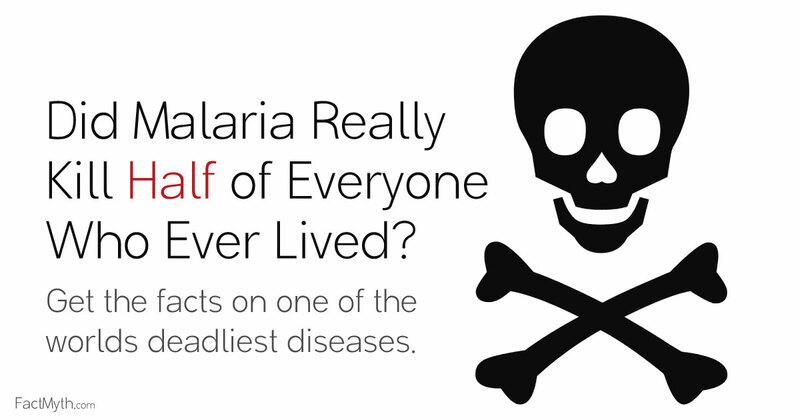 All this is a testament to the unprecedented numbers of humans that Malaria may have killed. And that is why they gave me malaria pills in the Navy. Now if I would only get a flue shot!